Church Hill Volunteer Fire Department responded to assisted with a fatal house fire in Chestertown Sunday afternoon, March 3, in the snow. Emergency apparatus lines Washington Avenue as firefighters battle a fatal house fire Sunday afternoon, March 3, in the snowstorm. 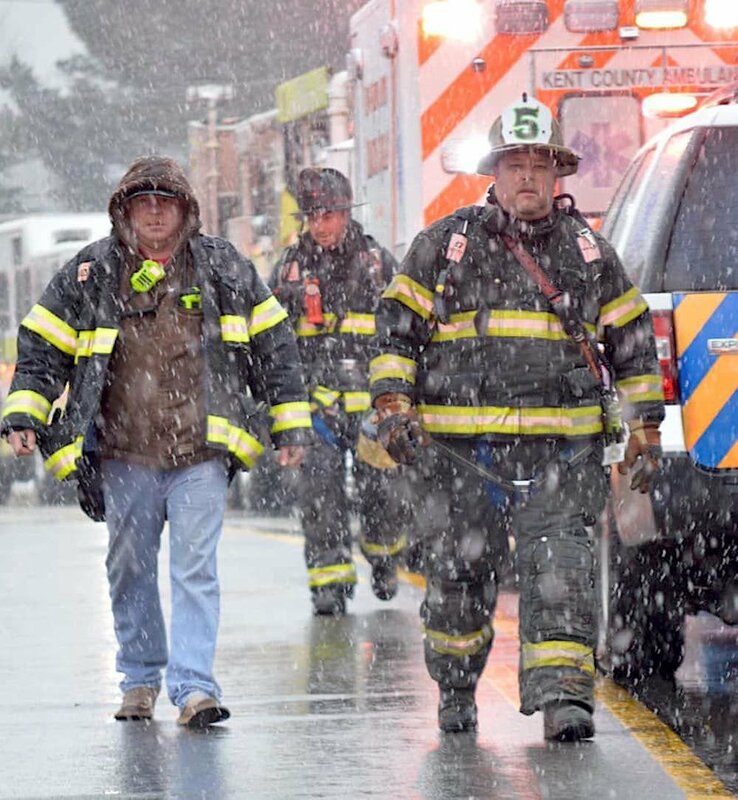 Church Hill Volunteer Fire Department responded to Chestertown in the snowstorm Sunday afternoon to assist with a fatal house fire. CHESTERTOWN — Deputies from the Maryland State Fire Marshal’s Office are continuing to investigate a fire that took the lives of of two women Sunday, March 3, in Chestertown. Tuesday afternoon, the fire marshal’s office identified the victims as Helen Rebecca Rodney, 65, owner of the residence at 828 Washington Avenue and and Gwendolyn Taylor Rodney, 80, occupant. A 911 call was received about 2:55 p.m. March 3 from a passerby who reported seeing smoke coming from the home, according to the news release from the fire marshal’s office. About 30 firefighters from Chestertown Volunteer Fire Company and mutual aid companies responded to the one-alarm fire. It took about 15 minutes to control the blaze, the fire marshal’s office said. Church Hill Volunteer Fire Department responded with three pieces of equipment and 15 volunteers to assist. One victim was removed from the house in cardiac arrest before Church Hill crews arrived. Church Hill crews split assignments. Half assisted with fire attack in the basement; the other half performed a secondary search on the first floor, where they located and removed the second victim. Helen Rodney was taken by ambulance to University of Maryland Shore Medical Center at Chestertown, where she later succumbed to her injuries. Gwendolyn Rodney was pronounced dead at the scene. The victims’ bodies were sent to the Office of the Chief Medical Examiner in Baltimore for autopsies to determine cause of death. Church Hill volunteers remained on the scene for about two hours. A smoke alarm was located inside the residence, but it is unknown if it activated, the fire marshal’s office said. The fire originated in the basement; the cause remains under investigation. Damages are estimated at about $40,000.